NEW TONIGHT — A TENSE STANDOFF AT THE UNIVERSITY OF NORTH CAROLINA IN CHAPEL HILL. PROTESTERS CHANTING FOR THE REMOVAL OF A CONFEDERATE STATUE. SEVERAL HUNDRED DEMONSTRATORS DEMANDING THE STATUE BE REMOVED FROM CAMPUS — MANY SEEN CARRYING BANNERS, MARCHING THROUGH THE STREETS. U-N-C SAYS THEY WANT TO REMOVE THE MONUMENT, BUT THEY’RE RESTRICTED FROM DOING SO BY STATE LAW. POLICE WATCH FROM BEHIND TEMPORARY METAL BARRIERS CIRCLING THE STATUE KNOWN AS THE CONFEDERATE SOLDIER SILENT SAM. THE STATUE STANDS IN HONOR OF STUDENTS WHO DIED IN THE CIVIL WAR. AT LEAST ONE PROTESTER HAS BEEN HAULED AWAY BY OFFICERS. DEMONSTRATORS RESPONDED BY CHANTING FOR HIS RELEASE. THIS RALLY JUST A SHORT DRIVE FROM DURHAM, WHERE A STATUE OF CONFEDERATE GENERAL ROBERT E. LEE WAS TORN DOWN BY PROTESTERS LAST WEEK. 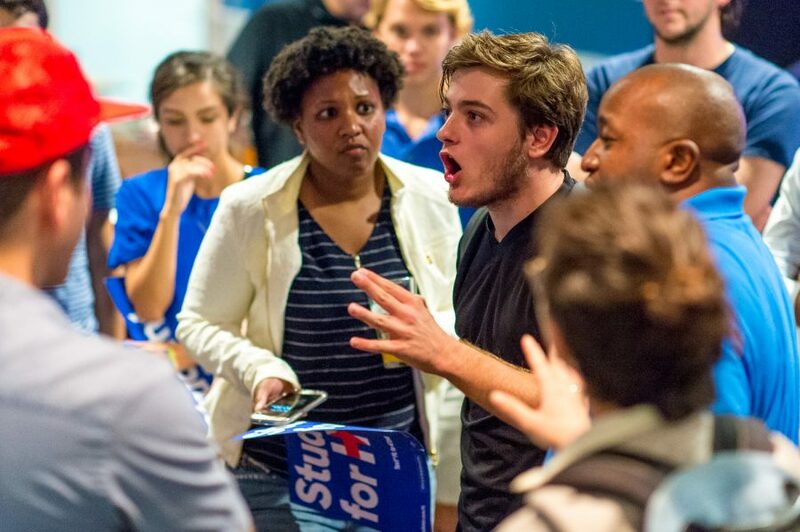 The Burrow, a bar and grill on Florida Atlantic’s Boca Raton campus, was filled with about 150 people Monday night as students of differing political backgrounds sat down to watch the first presidential debate between Hillary Clinton and Donald Trump. Black Greek letter organizations Alpha Kappa Alpha, Alpha Phi Alpha and NAACP at FAU hosted the event at the campus bar, which was attended by both the College Democrats and College Republicans. Catherine Theriault, the president of College Democrats, said the matchup was drawing so much attention because of the contrasts between the candidates. 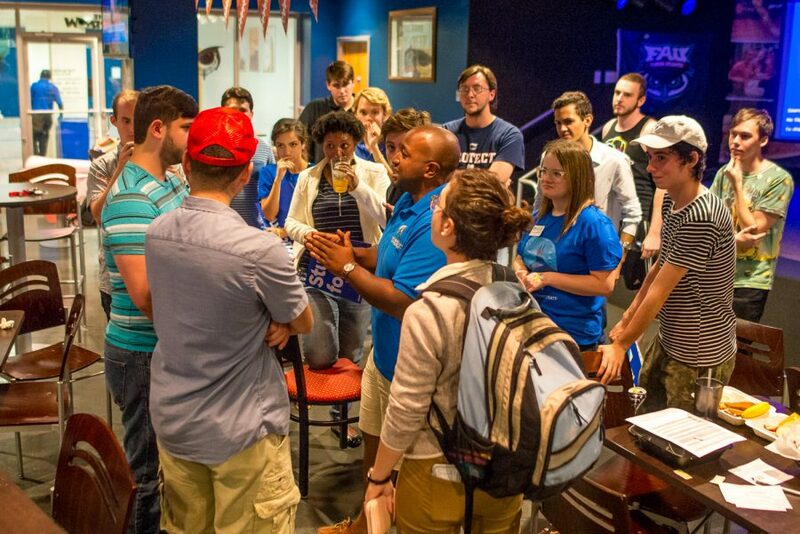 After the debate ended and the crowd at The Burrow thinned out, another debate formed between Justin Atkins (Vice President of the College of Democrats) and Andrew Paz (Communications Manager of the College Republicans). Photo by Max Jackson. The crowd had impassioned reactions to the debate as members of College Democrats and College Republicans engaged in heated discussions regarding race relations with law enforcement at the event’s conclusion, the first of three scheduled presidential debates. The scene was calmer across campus at Living Room Theaters, where Stephen Heidt, an assistant professor in the FAU School of Communication and Multimedia Studies, moderated a post-debate discussion among members of the audience. “I think what [Trump] had to do to win the debate was look presidential, look in control and I think he did anything but that,” Bruce Feldman, an FAU alumni, said during the discussion. The 90-minute, commercial-free melee allowed for a barrage of exchanges with two cameras fixed on the candidates. The Burrow was filled with audible disbelief from Clinton supporters and laughter and clapping from Trump supporters. Clinton fired back when Trump mocked her for staying home and preparing for the debate while he campaigned. “I’ve also prepared to be president and I think that’s a good thing,” Clinton said. The Burrow responded to the jest with applause. While many viewers tuned in for entertainment value, several students like freshman English major Samiha Hossain found the debate lacking in substance on important issues. At Living Room Theaters, one of the loudest jeers in the crowd came when Trump said he has formed a good relationship with African Americans. The NAACP of FAU was in attendance at The Burrow and participated in applauding Clinton for saying the country needs to address systemic racism. In the latest Quinnipiac University poll, Trump trails Clinton 66-24 among non-white voters, while Trump leads Clinton 50-44 among white voters when in a four-candidate race. Luke Turner, the director of political affairs for the College Democrats, found the event a great way to discuss political ideas centering around race. Justin Atkins, the vice president of the College Democrats, was seen debating the racial discrimination of stop-and-frisk policies with Andrew Paz of the College Republicans. Atkins said he felt like Trump dodged a question on race relations. There has not been an on-campus viewing party announced yet for the next debate on Oct. 9. Amber Ali and Thomas Chiles contributed reporting to this story. Taylor Craig is the lead video journalist with the University Press. For information regarding this or other stories, email taylorcraig634@gmail.com or tweet him @taylorcraig. Doug Oberman, a senior public safety/ law enforcement major, argues against the opinions of two students from the College Republicans about recent police shootings and several other topics. Photo by Max Jackson. 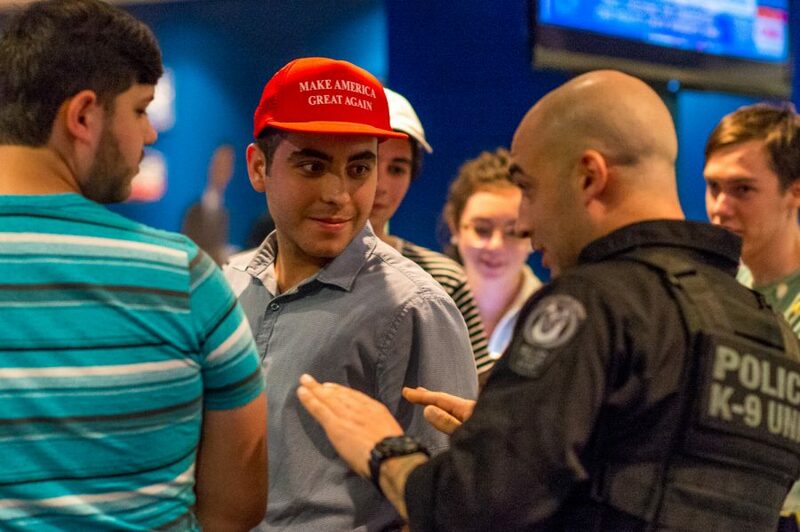 During the impromptu student debate, FAU Police officers were called to the scene to make sure the discourse remained civil and non-violent. Photo by Max Jackson. This skater group doesn’t mind the Breezeway construction. They have better places to skate. Senator Marco Rubio visits a Coral Springs restaurant to meet and interact with his supporters. Rubio is currently running against Democratic candidate Patrick Murphy to keep his seat in the U.S. Senate. During Florida Atlantic football’s 2016 media day, players from the team discuss which games they’re looking forward to for the upcoming season.